The Logitech G600 MMO gaming mouse is one of the finest gaming mice on the market. If you’re looking for a mouse with more programmable buttons than you’ve got fingers, the G600 is well worth the $80 price tag; it even gives accessories from specialized gaming accessory outfits like Razer a run for their money. The G600 sports 20 programmable buttons and clearly falls into the “more is more” hardware niche occupied by Razer’s Naga MMO mouse. In fact, both MMO mice are competitively price at $80. If you've never heard of this niche hardware category, know that MMO gaming mice are distinguished by a set of 12 keys mapped to the number row on your keyboard by default, which makes the hotkey-heavy gameplay of most MMOs easier on your wrists (and your brain) by letting you use your mouse for most of your spell-casting. The G600 has a few advantages over the competition, starting with an extra three buttons. In addition to 12 buttons on the right side of the mouse, the left and right mouse buttons, and two additional buttons up top, the G600 sports an extra button that sits below your pinky. The G600 registers pushing the mouse wheel to the left or right in addition to the standard button action when you push down the wheel itself. While that may be confusing to read, in practice the extra buttons are very convenient once you spend some time with the device. On a mouse that’s trying to stuff extra buttons onto every available surface it’s tough to find places where the user can actually conveniently press them, but Logitech somehow pulls it off with this mouse. The other big win for Logitech is the software customization for the G600. I’ve never been a huge fan of competitor Razer’s Synapse software; it’s not easy to use and requires you to sign up with Razer first, but it does provide a lot of customization options that vastly increases the utility of Razer peripherals. The G600’s software can't quite match the Razer Synapse software in terms of features, but it comes remarkably close and proves easier to use. 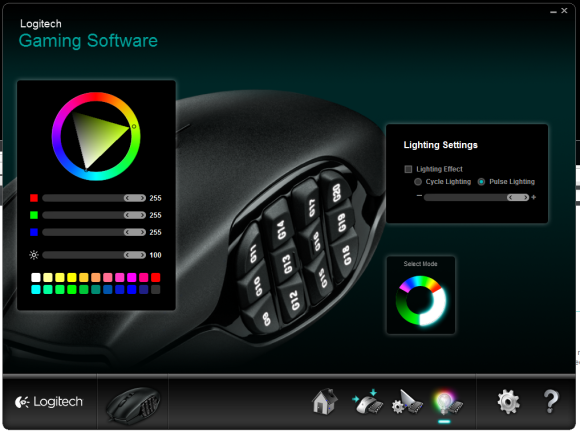 While it doesn’t have Synapse’s capacity for programming complex macros and assigning them to your mouse’s various extraneous keys, Logitech's driver software does let you remap every key on the G600 quickly and easily. It also sports a few tricks of it's own, including an auto-detection system that scans your hard drive for compatible games and then automatically switches the mouse’s layout to give you easy access to useful keys without having to remap the mouse yourself. While I wasn’t able to test this feature out with every compatible game on my drive (over a dozen popped up when I did the initial scan, with easily a hundred more optional packages available for download for games I didn’t currently have installed) the games I did test switched the G600 to intuitive default button layouts. Not only was this useful, it was also much quicker than the customization process for other mice. While the software is a definite win for Logitech, the mouse hardware itself has a few problems. For starters, like almost every mouse with this many buttons a lot of them are simply too difficult to reach. The bottom two rows are difficult to reach and clicking the two buttons below the mouse wheel with your middle finger while keeping your index finger on the left mouse button requires positively inhuman dexterity. The mouse is also not going to win any customers with its ergonomics. I have relatively large hands so the G600 wasn’t uncomfortable for me to use personally, but it’s not hard to imagine users finding the G600 difficult to use for long periods. Other mice at this price point let you adjust the ergonomics to make sure your hand can rest on the mouse comfortably, but the G600 has no such feature. Despite these hardware issues the G600 one of the most pleasant and easily customized mice I’ve ever used. If functionality, not ergonomics is your primary concern and you’re looking for a quality MMO mouse, the G600 is a hard mouse to beat. Logitech delivers an affordable high-end gaming peripheral that PC enthusiasts will love. Large array of convenient buttons. 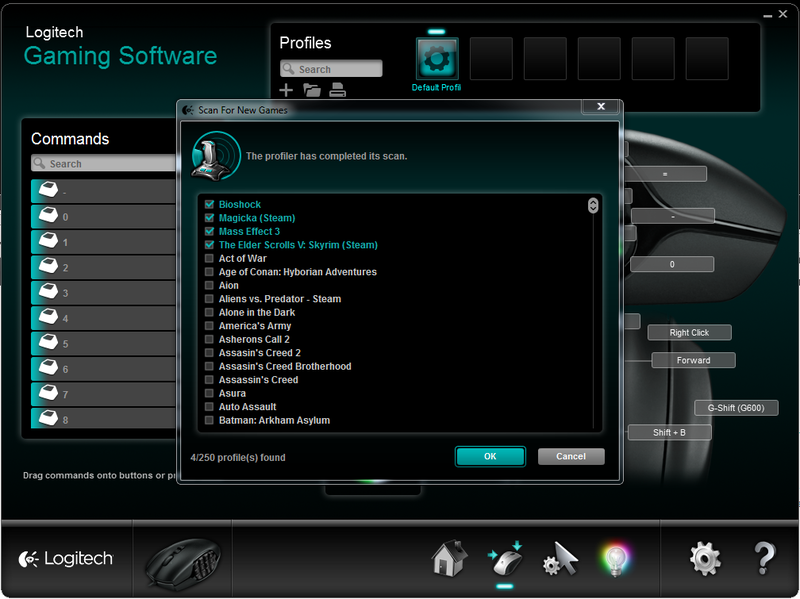 Driver software makes it easy to customize the mouse for individual games. Several buttons are difficult to reach. Grip is less ergonomic than other, similarly-priced mice.